North Korea: Does ‘Never Again’ mean anything? All the “Never Agains,” all the Holocaust memorials, all the anguish over starvation in Biafra, killing fields in Cambodia, horrors in Bosnia, machetes in Rwanda, murder in Darfur, cannot hide the ugly truth: Humanity does not respond to mass murder. Item: Just last week, the UN issued a massive, 400-page report on mass murder in North Korea. Item: Already this week, the report is all but forgotten. The author of the UN report on human rights abuses in North Korea, Australia’s Judge Michael Kirby, amended his report in a radio interview. The report opened a window onto the “gravity, scale and nature” of human rights abuses in North Korea that do not have “any parallel in the contemporary world.” Alas, Kirby said in an interview, he needed to add a word to “gravity, scale and nature,” and that word is duration. Decade in and decade out, North Korea’s evil continues unabated — and we sit. We do nothing. The report was under the auspices of the normally timid, controlled United Nations. The reports shredded every excuse of “we didn’t know” or “we couldn’t prove.” The report is chilling. Islamic eschatology relates to this same AntiChrist as Al-Masih ad-Dajjal (Arabic for “the false messiah”). He appears pretending to be Masih (i.e. the Messiah) at a time in the future and is directly comparable to the figure of the Antichrist, as does Armilus in Jewish eschatology. Switching now to the subject of North Korea: Although I am certainly not indicating that the Kim dynasty is or will bring forth the AntiChrist, to some degree I would suggest that the decades-long North Korean dictatorship does allow a glimpse into what the forthcoming Antichrist regime might be like. The mass starvation, brutal oppression and religious persecution of Kim Jong Il’s Stalinist North Korea regime, described as “worse than 1984”, could very well be a forerunner of what this AntiChrist will attempt to make life like for believers. The North Korean constitution disallows belief in any higher power than its despot. Christianity or any other religion is suppressed. Somewhere in the area of up to 300,000 North Koreans have fled their country to China to live illegally, risking their lives to flee the starvation and oppression of Kim Jong Un’s Stalinist North Korea regime. Thankfully, many of these refugees make their way to “safe houses” set up by Christian activists who run a modern day “underground railroad” to help these refugees escape to safer countries. A new North Korean declaration of war on Christians? Foley says that what has surprised him the most personally about North Korean underground Christians is their acceptance that the practice of their faith will naturally lead them to imprisonment in a concentration camp. “They do not regard imprisonment with surprise or outrage, as if it were unusual,” notes Foley. Ahn Myong-Chol witnessed many horrors as a North Korean prison camp guard, but few haunt him like the image of guard dogs attacking school children and tearing them to pieces. Ahn, who worked as a prison camp guard for eight years until he fled the country in 1994, recalls the day he saw three dogs get away from their handler and attack children coming back from the camp school. “There were three dogs and they killed five children,” the 45-year-old told AFP through a translator. “They killed three of the children right away. The two other children were barely breathing and the guards buried them alive,” he said, speaking on the sidelines of a Geneva conference for human rights activists. The next day, instead of putting down the murderous dogs, the guards pet them and fed them special food “as some kind of award,” he added with disgust. “People in the camps are not treated as human beings… They are like flies that can be crushed,” said Ahn, his sad eyes framed by steel-rimmed glasses. After fleeing the country two decades ago, Ahn worked for years at a bank in South Korea but gradually got involved in work denouncing the expansive prison camp system in the isolated nation. Three years ago, he quit his bank job to dedicate all his time to his non-governmental organization, Free NK Gulag. “It’s my life’s mission to spread awareness about what is happening in the camps,” he said. Ahn Myong-Chol knows all too well the brutal mentality of the camp guards. When he, as the son of a high-ranking official, was ushered onto the prestigious path of becoming a guard in 1987, he says he was heavily brainwashed to see all prisoners as “evil”. 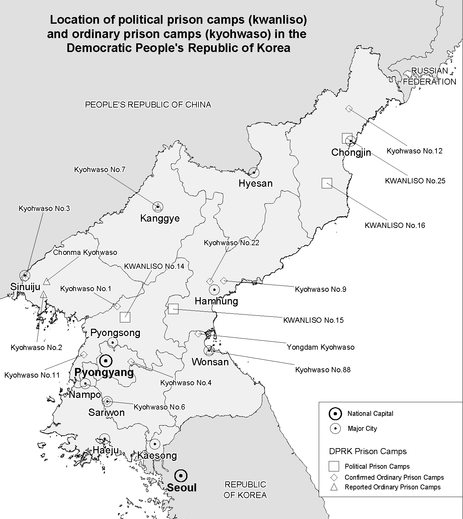 At his first posting at camp 14, north of Pyongyang, he was encouraged to practice his Tae Kwon Do skills on prisoners. And he recalls how guards were urged to shoot any prisoner who might try to escape. “We were allowed to kill them, and if we brought back their body, they would award us by letting us go study at college,” he said. Some guards would send prisoners outside the camp and kill them as escapees to gain access to a college education, he added. Although he witnessed numerous executions, starving children, and the effects of extreme torture, it was not until he was promoted to be a driver, transporting soldiers back and forth between camps, that he began to question the system. During his travels he sometimes struck up conversations with prisoners and was astonished to find that “more than 90 percent” of them said they had no idea why they were in the camp. The UN report is written by a three-member UN panel headed by Michael Kirby, an Australian former judge, and it is extraordinary in the fierceness of its condemnation. Mr. Kirby told journalists North Korea was comparable to “Nazi Germany,” and the report itself urges the UN to refer the situation to the International Criminal Court (ICC) in The Hague for prosecution for war crimes. In a letter sent directly to Kim Jong Un, the North’s dictator, the commission warned that he could be held accountable for crimes against humanity. A 36-page summary of the 400-page report can be found here. The Chosun Ilbo claims that Jang Song-taek, Kim Jong-un’s uncle, was executed chiefly for his role in overseeing a thinly-disguised prostitution ring. This according to the Kim family’s former sushi chef, Kenji Fujimoto, who claimed Jang Song-taek was eliminated because of his role supplying young women for a “pleasure brigade” for former leader Kim Jong-il, because his son detested his father’s womanizing. Fujimoto told the U.K.’s Daily Mail on Saturday that when Kim Jong-un returned to North Korea aged 18 from study abroad, he “found himself exposed to his father’s ‘pleasure brigade,’ ” groups of beautiful young women who sing, strip and perform massages or sexual favors. Today, there are some 25,000 North Korean defectors living in South Korea. While they have escaped extreme poverty and political repression, life in the South can also be hard. In fact, the suicide rate among North Korean defectors is six times that for South Koreans. By comparison, 95 percent of North Korean defectors are unemployed after they leave Hana Center where they stay for three months familiarizing themselves with South Korea and its way of life, according to Park. According to a UN report, North Korea’s spending on luxury goods has more than doubled from an average of $300 million a year to $646 million in 2012, when Kim Jong-un assumed control following his father’s death, Kim Jong-il. The 372-page report said the country continues to allocate a “significant amount of state resources for the purchase and important of luxury goods” while hunger and malnutrition take a heavy toll on the population. These items violate UN sanctions imposed on North Korea prohibiting “the provision of luxury goods” adopted in 2007. The report did not examine how the items were imported into the country. North Korean dictator Kim Jong-un reportedly treated himself to a dozen luxury cars, top quality pianos and a private theatre for his closest allies and top aides. A former North Korean official who managed to escape the country said Kim funded his lavish lifestyle by trafficking ivory from Africa to China and selling alcohol to Islamic countries. The money was transferred into parallel funds outside of the state budget to cover “personal expenses of the Supreme leader, his family and other elites”. The report released by the UN Commission of Inquiry on Human Rights in North Korea constitutes a clarion call to action. According to many analysts, it will also amount to little, unless China, one of North Korea’s few allies, gives its consent. “So what is likely to happen? Nothing,” write the editors of New York Post. They argue that while the report exposes a slew of North Korean atrocities, it may be more eye-opening to see the extent of the UN’s failure to do anything about it. Bloomberg View’s editors suggest that China may be ready to back away from Kim Jong-un. “China’s interests lie in a transition to minimally acceptable standards of behavior in Pyongyang, not in supporting the insupportable pending the outright collapse of Kim’s regime,” they write. Even if the Chinese Security Council roadblock is overcome, however, that doesn’t mean that Kim Jong-un will ever face judgment. The editors of the Ottawa Citizen write that the Security Council has a bad record of actually catching those they refer to the ICC.